Sustainability and responsible corporate behavior both have a long tradition and high priority at Brenntag. Together with our employees worldwide, we are striving to contribute towards greater sustainability in the chemical industry – as Brenntag’s market leadership also entails a big responsibility for our company. Safety First - We want to be the safest chemical distributor worldwide. The health and safety of our employees and our business partners are our top priority. We are bound by the highest standards and we are working continuously to further enhance our safety culture within our company. We invest in our infrastructure and train our employees with this goal in mind. Environmental protection – We use resources efficiently. We endeavor to save resources or use them optimally around the world, and to minimize the impact that our business has on the soil, water and air. At our locations we implement diverse measures in order to use electricity, fuel, water and other resources as efficiently as possible and to reduce our emissions. At the same time, we support our customers with sustainable solutions and products that help to preserve the environment. Social commitment – We are active on a personal and local level. At its more than 500 sites in over 70 countries worldwide, Brenntag is present as an employer, a business partner and a neighbor in the local communities. We see ourselves as part of these communities, as a corporate citizen, and we maintain a lively dialogue with them and aim to contribute to a positive environment. Primarily driven by our employees, Brenntag supports the communities in many different ways, e.g. with corporate volunteering projects, money and in kind donations and expertise. Supply chain responsibility – We want to achieve transparency. Brenntag plays a key role in the chemical industry’s supply and value chain. We maintain a close and ongoing dialogue with our suppliers and customers – also with regard to sustainability issues such as occupational safety, environmental protection, working practices, supplier management and compliance. As a member of the industry initiative Together for Sustainability, we are supporting a responsible procurement and striving to make further improvements to the suppliers’ ecological and social standards. UN Global Compact membership – We encourage sustainable development. Product stewardship: We stand for a safe handling of chemicals. Brenntag takes all appropriate measures to ensure the proper handling of our products while they are under the Group’s stewardship (including procurement, packaging, classification and labelling, handling, storage and transportation). Since 2002 Brenntag has been participating in the Responsible Care/Responsible Distribution program of the International Council of Chemical Trade Associations (ICCTA). Our environmental performance and safe handling of chemicals are reviewed and documented by independent third parties on a regular basis. Learn more about sustainability at Brenntag. 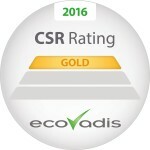 Brenntag has been awarded the Gold Recognition Level of the international rating agency EcoVadis for its sustainability management in October 2016. EcoVadis evaluates companies’ sustainability performance in terms of the following four categories: environment, labor practices, fair business practices and sustainable procurement. Download Brenntag's current Sustainability Report (PDF, 6 MB).